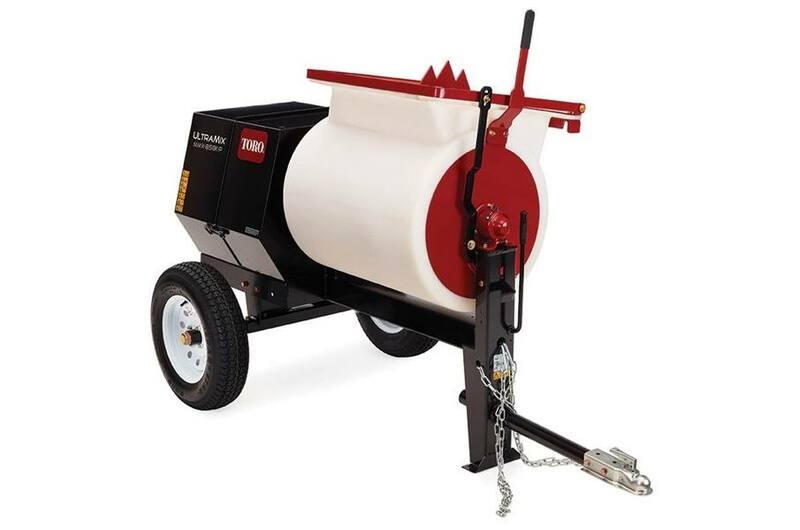 Toro's UltraMix mortar mixer is the ultimate in mixing performance. Together, the symmetrical drum design and patented paddle configuration provide more paddle and drum contact with the mortar for a faster, more blended mix. The 6 cubic foot MMX-658K-P has a Kohler engine and durable Polyethylene drum for versatility and productivity around any size jobsite. Tow poles are sold separately. Powerful 9.5 gross horsepower Kohler engine with large capacity 1.85 gal. fuel tank. Paddle Design: Patented paddle design moves mix back and forth horizontally as well as in the circular motion, to create a smoother, more uniform mixture for greater efficiency. Drum Design: Symmetrical drum design eliminates mixing dead zone and increases mortar contact with the drum and paddles for a thorough, smooth mix. Cowl Design: Cowl venting design provides better air flow to cool the engine during use while protecting the engine and drive train from debris.